Electronic waste (E-waste) is all the material residue produced when we discard old electronic equipment. With the elevated use of electronic equipment in the modern world, this type of waste has become a large environmental problem when items are not discarded in appropriate locations. This disposal is made when the equipment has a defect or has become obsolete (past due). The problem occurs when this material is discarded in the environment. As this equipment contains chemical substances (lead, cadmium, mercury, beryllium, etc.) in the composition, it may cause soil and water contamination. Besides contaminating the environment, these chemical substances can cause grave illnesses in people that collect products from dumpsters, landfills, or on the street. These pieces of equipment are composed of a large quantity of plastic, metal, and glass. These materials take a long time to decompose in the soil. 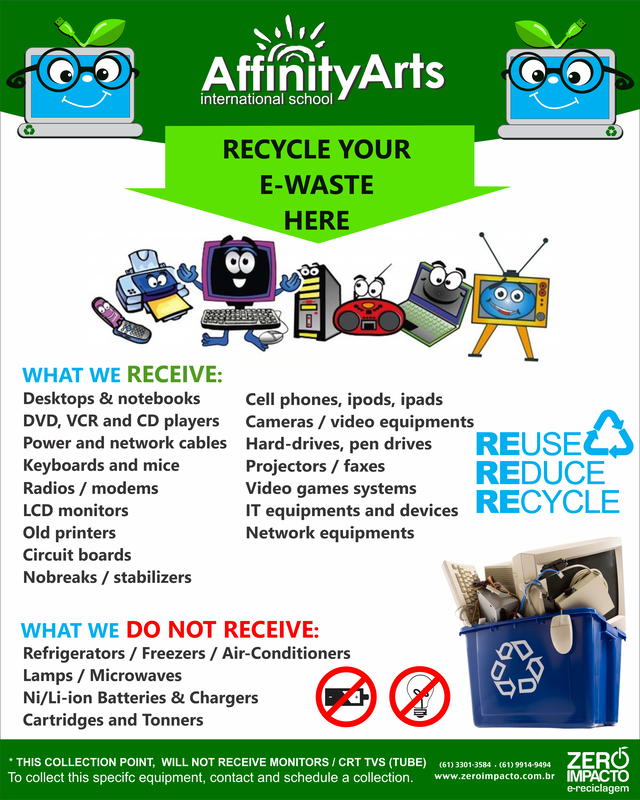 To not cause contamination and pollution of the environment, the correct thing to do is to discard the electronic waste in appropriate locations and Affinity Arts is receiving E-waste that can be disposed of at our school as a dropping point at the front entrance of the school. Cellular phones and batteries can be taken to cellular phone businesses. They will dispose of this waste in a way that will not harm the environment. Another option is to donate equipment that is in good condition, but not being used, to social entities which work in the area of digital inclusion. The first step to avoid polluting the environment is to recycle at home, at school, and at work. E-waste should always be separated from organic and recyclable materials (paper, plastic, glass, and metal). Around 40 million tons of E-waste are created each year in the world. Among the emerging countries, Brazil is the country which generates more E-waste. Each year, Brazil throws away: around 97 thousand metric tons of computers; 2.2 thousand tons of cellular phones; 17.2 thousand tons of printers.